The Hyrkanian temptress joins the world of Pop! with 2016 Funko Pop Red Sonja. Collectors can find a pair of figures in the debut release. Red Sonja made her first appearance in Marvel Comics' Conan the Barbarian #23 (1973). Since then the She-Devil with a Sword has starred in over 500 issues, including several self-titled series runs, mini-series, and one-shots. Sonja now appears in monthly issues of Red Sonja, the She-Devil with a Sword published by Dynamite Comics. Even though she becomes a fierce warrior, Red Sonja's story begins with a vicious attack by mercenaries who killed her parents and two brothers. Their leader stole Sonja's virginity which ultimately led to her transformation to Red Sonja. As fans may recall, Brigitte Nielsen played the lead role in the 1985 film Red Sonja, portraying the fiery vixen’s strength and swordsmanship perfectly. Fittingly, Funko Pop Red Sonja is numbered as part of the Pop! Heroes line. Standing approximately 3 3/4" tall, Sonja is posed in her silver chainmail bikini armor, gold-colored gauntlets wielding her mighty sword. 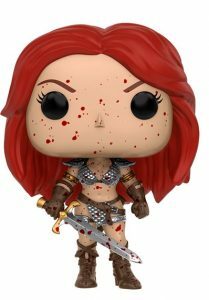 Featuring the same pose as the main Red Sonja figure, a blood splattered variant is issued exclusively through PX Previews. In addition, her fellow barbarian Conan also has his own line of Funko Pop figures. Funko Pop! Red Sonja Signed by Gail Simone!